Parenting is a crazy way to spend the day. The slices abound really, but just a few from yesterday. . . 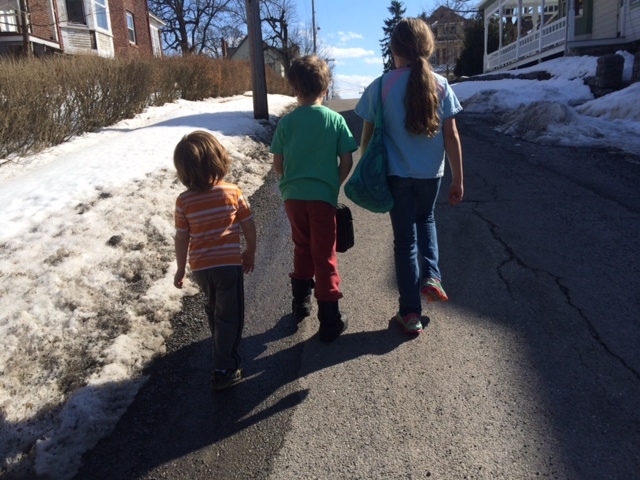 The walk: I forced the children to go on a walk. Convincing them to stop their random hanging out to go on a mission took stamina… but soon we were off. 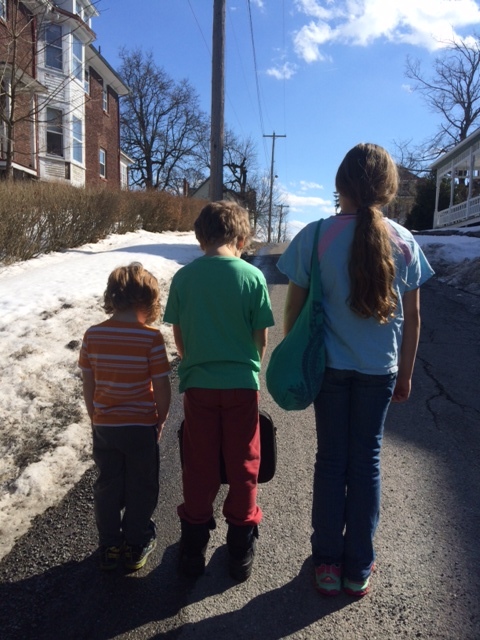 They all decided to wear short sleeves, even though I thought they would get cold eventually. The site of them walking in short sleeves begged to be photographed. Here’s what I eventually ended up getting… so cute, right? Facebook cover photo worthy. It was actually the perfect picture to illustrate their actual feelings about going on a walk, carrying bags no less! The Post Office: Just imagine two boys, 8 and 5 happily experimenting with the mail slot. The envelope is there! Now it’s gone! Still gone! Still gone! Still gone! The Library: Try as I might, I can’t get my kids to love the library as much as I do. Yesterday I didn’t even really like it. It was crowded, and someone was wearing too much cologne. The computer in the kids section always frustrates me… it turns my book loving 5 year old into a computer game junkie. But the science activity was fun, and we picked out some movies, paid our fines (yep. fines. ), and I got a book, “Beyond the Laughing Sky,” which has been on my to read list. Luckily my kids are shy, so when a little boy came up to E at the computer and asked if there was another computer to use, my kids all jumped up. “We should actually go.” L said as E ripped the headphones from his ear and all but threw them at the little boy. We checked out our movies and my book, as my boys chanted their favorite line from the NFL bad lip reading: “I thought about what you said man, I got my legos and I’ll bring them, then we can play. All day. ” Time to leave the library! 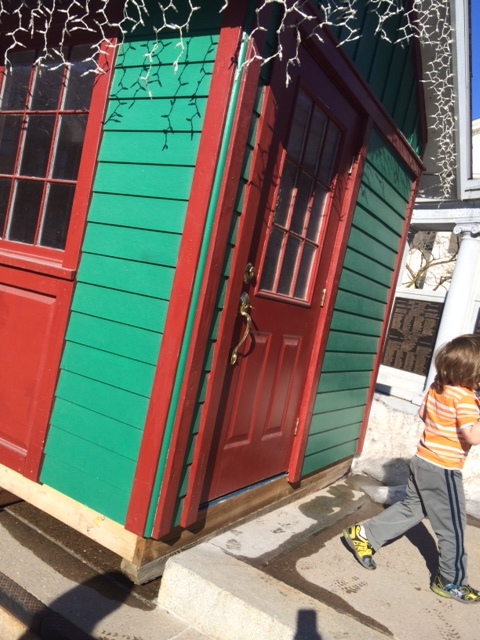 Coffee Shop “Small town Twist:” Headed to the coffee shop, we passed the deserted Santa House, and the kids looked inside. It’s spring, Santa! Take your house back to the North Pole, please! The kids decided they’d much rather go to the ice cream shop. I said, “But ice cream is more of a summer activity.” and E replied, “But it won’t melt!” So against my better judgment, in we went. Our local ice cream shop used to be a Dairy Queen, but is now an independent local “Twist.” We try to like it. Even my vegan self wants local businesses to work. But every time we go it just doesn’t work out for us. This visit started with broken ice cream machines, “We have dipped vanilla and chocolate,” we were told. The kids chose their flavor and asked for sprinkles. The woman behind the counter said something and I asked her to repeat. “Would the kids like to watch the sprinkle machine?” My three kids politely turned to watch as the machine started slowly turning, dropping sprinkles as it buzzed. We smiled at each other sharing the joke that this was not really very exciting. Their ice creams each received about 15 sprinkles, and we sat at a table, noticing the empty ice cream cake freezers and we laughed. Later at home, telling the story to Mr. Thought, H wanted to be sure we weren’t laughing at the woman who was serving our ice cream. We talked about that, about empathy, and about how we were surely laughing at our circumstances, not the nice worker. 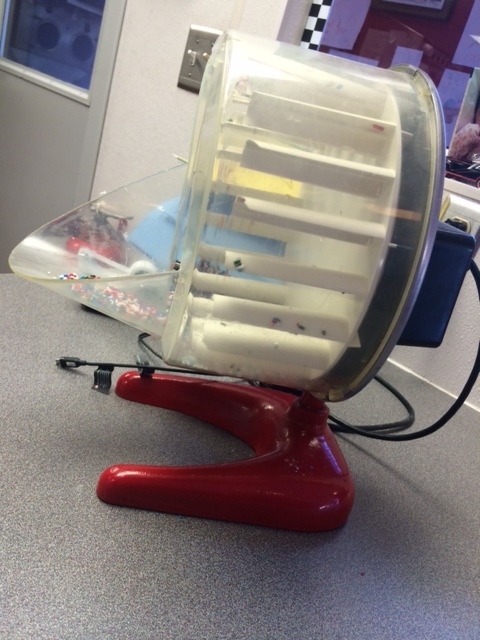 Some people go to theme parks during Spring Break… We get the Sprinkle Machine! 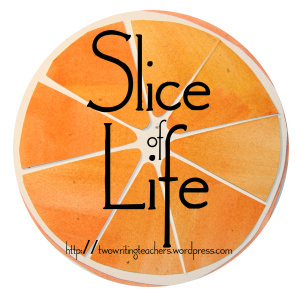 You are so right… Parenting brings lots of slices to your life. I love the sprinkle machine humor and how you were able to make a teachable moment from it. This post had me laughing out loud a couple of times! This is one of the reasons I love being a mom so much – there is always something to laugh at!